I tried to find a picture of a menacing David Attenborough here but since he lives in a state of perpetual childlike joy I couldn’t find one. 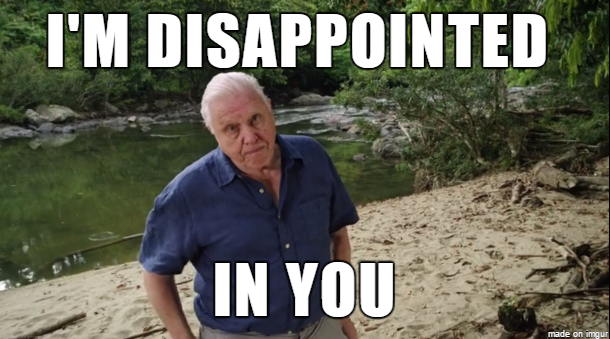 So here’s one of him looking mildly disappointed: and is there anything more devastating than the idea David Attenborough being disappointed in you? They don’t even pretend to be coastguard. Black Ops are not even trying to be covert any more. So from here we go to Bristol Cove, a town in the Pacific Northwest which is obsessed with mermaids and contains a mix of people who wear thick woolen clothing in the weather and others who wear shorts. I think Pacific Northwesters have the same weather attitude as Canadians but more umbrellas and less snow shovels. Introducing the Pownall family, local celebrities because they’re descended from founding fathers (is this really a thing in America? Do you really care? “My great great grandfather was influential in setting up this small village” is something you put on your CV or something?). They’re charming, media savvy, great grandaddy was allegedly involved with mermaids and this town is so very very very boring that this is what passes for exciting celebrity. Time for the mermaid to arrive. We start with an eviscerated shark which is probably an ominous sign because marine animals which kill big sharks are worrisome. It also makes the marine biologists suspicious. I do not want this guy to be my GP. Seriously, someone needs to look at this doctor. He hurries to see Helen Hawkings with her mermaid knowledge and Helen tells him that in the water, Mermaids naturally see humans as prey. Which is something that humans never understood (presumably seeing it as more of a murder or attack than a predatory hunt). Humans responded by annihilating mermaids in a genocidal campaign. And the Pawnall family was heavily involved. I do like the presentation of mermaids here - she’s alien, she’s aggressive, she’s dangerous, she’s menacing and even the power of the siren song isn’t really seductive. Compelling and obsessive but not seductive. Even finding her naked by the side of the road hasn’t really presented as sexual. 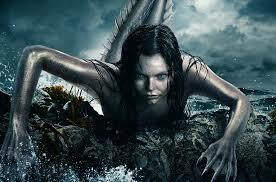 She’s both menacing and vulnerable which is an interesting shift on the common depictions of mermaids. I’m intrigued - and impressed by how well Ryn’s alien-ness is presented.